A couple of years ago a friend suggested to me that I should read The Hunger Games. My response to him was that I did not want to read a book series just because everyone else was reading it. He continued in trying to persuade me by saying that everyone was reading it because it was really very good. He loved it he said. I should read it based on his opinion alone. "No," I told him again. I do not read books that everyone else is reading and raving about. I just do not do it. "You Hipster you," was his response to me. Hipster? Me? No way. Hipsters are older teens and younger twenty-somethings who wear clothes that are cool for the simple fact that they are uncool. They wear glasses they don't need. "Ironically". They avoid places that are universally loved and hate things that the world has agreed to love. Me? No, I am not a hipster. I am a mom. A mom who wears raggedy jeans with holes in them and Loki or Doctor Who t shirts, and Converse high tops. Ummm... well, I do actually NEED my glasses. I am a mom who scoffs at the idea of Watching Breaking Bad or Orange is the New Black. You know, because they are inappropriate. Okay, so I actually love things that are inappropriate and the real reason I don't watch those shows is because they are universally loved and I hate liking what everyone else likes. Okay... crap! I am somewhat of a hipster. A hipster mom. Double crap! Yes, I own one of these shirts. 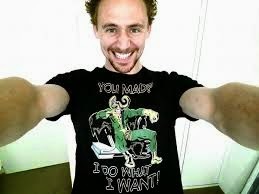 And yes, that is Loki (aka Tom Hiddlston) wearing one. Somehow that realization did not however make me read The Hunger Games. I did eventually read it though. After I watched the movie. It left me with too many questions. Questions like: "Wait! Did she actually start to have feelings for him, or was she just pretending? What the hell was she thinking?" And so, I read the book because we all know that the book is always better than the movie and most certainly has more details. Most important of all, it gives us a look into the minds and thought processes of the characters (or at least the main character if told in first person). So, I read the book to get my answers. It took me two days to finish the book. Then I read the second book. Another two days. Then I read the third book. Once again, two days. My friend had been right. They were really good and I did love them. A total slap in the face to my hipster ways. I got something very important out of those books and it had nothing to do with the story itself. What I got was the freedom to love things that other people also love. I learned that sometimes the masses are right. It is not all subliminal messaging and mass hysteria or mass love or whatever you would call that. This new found freedom has allowed me to enjoy some great books that I would have otherwise skipped. It has also led me to a few that left me scratching my head and believing that hype really can lead to mass hallucination of love. But, I do find myself with a little less of a hipster mentality when it comes to literature. Now when it comes to clothing.... you won't find me dressing like the other moms anytime soon!